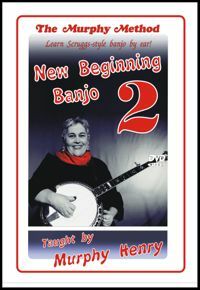 NEW Beginning Banjo 2 (High Definition): Still keeping it easy. Familiar songs make it fun. Lots of exciting new licks. Plenty of familiar licks. More easy improv. We’re already teaching you to jam. Chords, ending licks. Some of the most important banjo licks ever are taught here. Don’t skip this one! Foggy Mountain Breakdown, I Saw the Light, Bury Me Beneath the Willow, Do Lord, John Hardy. DVD or Download. No Tab!